The FCC today approved the unannounced Samsung SM-G906S, which is widely believed to be the Korean version of the Galaxy S5 Prime. According to the FCC, the SM-G906S is the same device as the SM-G906K and SM-G906L. The reason why the handset has three slightly different model numbers is that it’s supposed to be launched by all three South Korean mobile carriers: SK Telekom, KT and LG U+. Unfortunately, the FCC didn’t reveal too many details about this alleged S5 Prime. However, it does show that the smartphone features LTE band 5 and band 17 - a combination of bands that no US carrier is supporting. Several weeks ago, we exclusively posted photos that reportedly show the Samsung Galaxy S5 Prime - although, of course, we can’t confirm their authenticity just yet. In any case, the S5 Prime should be Samsung’s first smartphone to offer a Quad HD (1,440 x 2,560) display. Other expected features include a quad-core Snapdragon 805 processor, 3GB of RAM, and Android 4.4.3 KitKat. Prior to being approved by the FCC, the SM-G906 also visited the Bluetooth SIG, and South Korea’s equivalent of the FCC. 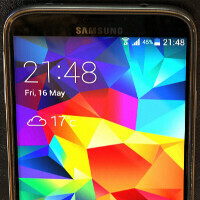 It’s not clear if the final name of the new high-end smartphone will be Galaxy S5 Prime. We're hearing that Samsung may choose to call it Galaxy Alpha, or Galaxy F. We hope to find out more about this in the near future, so stay tuned. If this phone (with these alleged specs) is confirmed by the time the G3 comes out, I may just have to wait a little longer for this one. It seems pretty sick. I know I could look it up, but perhaps someone can give me a short, simple explanation. Why does the FCC have to approve Samsung phone models are are destined for the Korean market? Really.... Lol the FCC approves phone bind fit American carriers. From the article: "The FCC today approved the unannounced Samsung SM-G906S, which is widely believed to be the Korean version of the Galaxy S5 Prime." Im not sure...probably because the phones are manufactured in China. USA is the main market for China. The FCC approves phones bound for foreign markets so those phones can be used in US when roaming. This may be why they cut orders for the original S5 from suppliers. Hopefully it is. Still waiting on the note 4 personally.